August was quieter at Wild Bird Rescues with a total of 26 sick or injured birds attended, plus several releases. This lower number was due in part to time I had off. hours of every day, 7 days a week can be taxing. Having set holiday times would probably make sense, but I always feel guilty so hang in there until it all gets too much. Not clever, of course. This time it felt serious and I was genuinely concerned. I’ve offered my services now for free, for 13 years straight and feared it might be coming to an end. Fortunately that was the ‘pre time-off’ me speaking. After 6 days of doing no rescues I felt a lot better, but was acutely aware that some things had to change if this service was to continue. My first move was to cancel all calls from the RSPCA. That worked real well … for about 3 days. The girls and guys on the ambo’s quickly found themselves deep in it, mainly with calls for hooked swans. 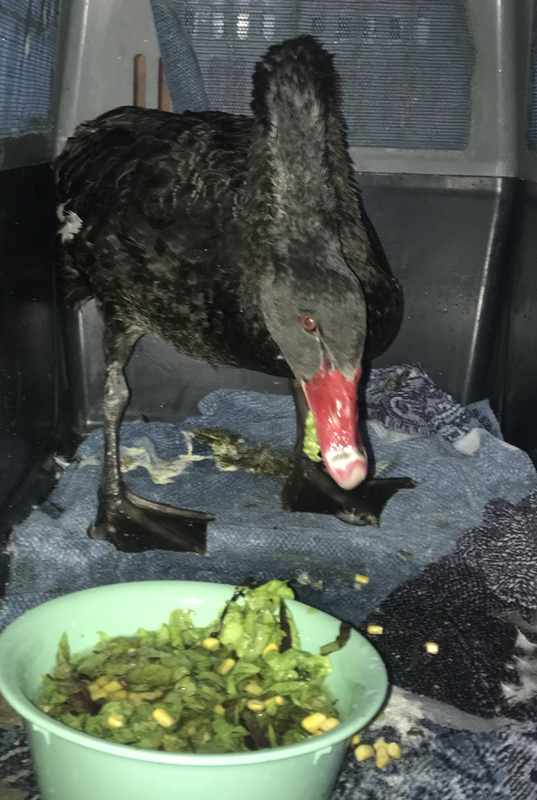 Compared to Wild Bird Rescues, which is a local specialist service that moves instantly on all such calls, the RSPCA ambos, all based in Brisbane and overloaded with work, had no hope. Witnessing their distress I immediately re-instated my services, but for swans and pelis only. (OK, raptors, entangled cormis and darter too). This is working well. The load has lightened and I’m at ease knowing those big birds are safe. However, more changes were needed. Some time ago I began letting all phone calls go to message so that people had to listen to what I would and wouldn’t rescue before they asked for help. The recorded message also provides numbers for other services. The problem was that neither the callers nor I were following the rules. Most people who find WBR on the web take no notice at all of the description that accompanies my phone number. They just call anyway. 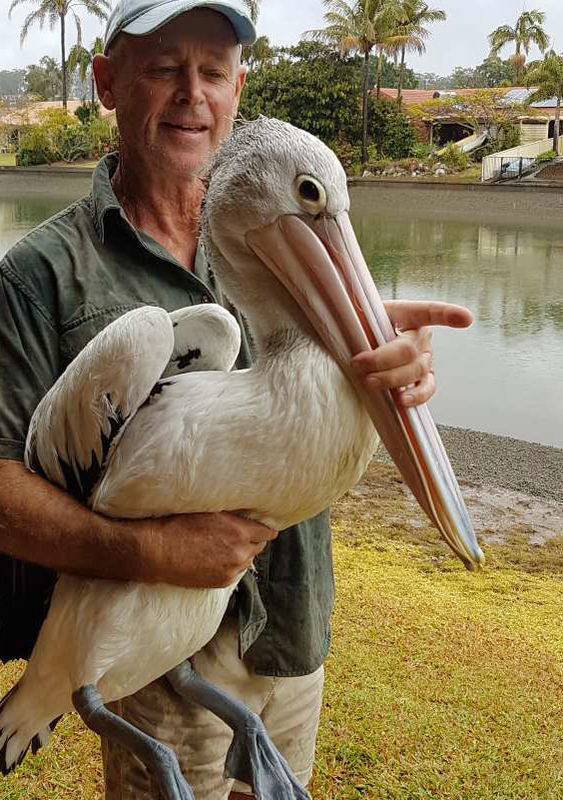 It means that 4 out of every 5 calls have nothing to do with the pelicans, swans and hooked and entangled birds that I say I’ll rescue. However, the main problem was that I kept breaking my own rule by picking up the phone before it had gone to message and the caller had heard the job description. Even worse was that I’d take jobs which were well outside of my brief. Things had to change, and they have. Now I let ALL calls go to message. Where a rescue fits my brief the caller can leave a message and I’ll get back to them quickly. This has reduced my workload to a more comfortable level yet still ensures that swans, pelis, flight capable birds and difficult rescues get handled. 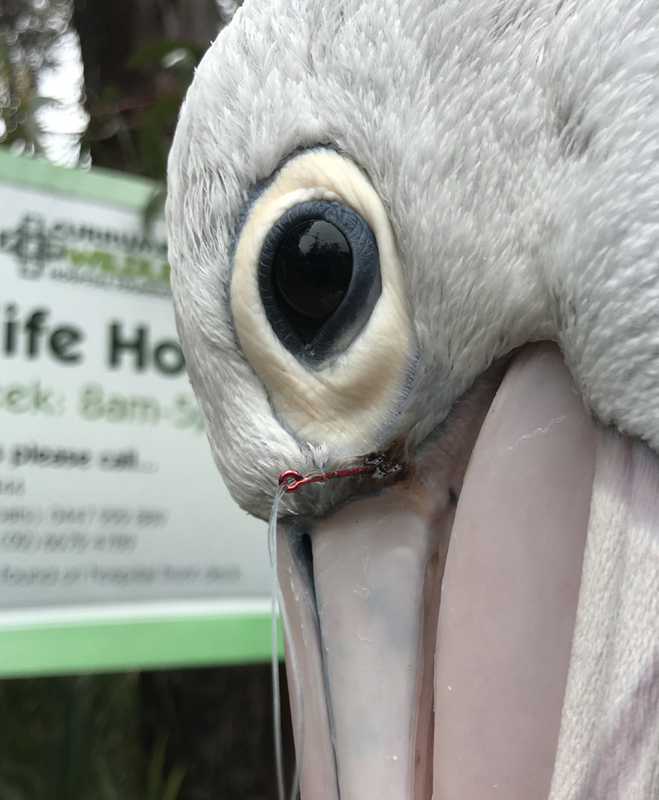 This peli with the nasty hook under its left eye had been hanging around Currumbin Waters for nearly three weeks. Mary Grant, the catcher from Tweed Heads (aka ‘The Blue Bird of Happiness’), had been after him but had no success. Some pelicans can be very hard to catch, especially those which frequent inland canals hoping for a free hand-out. This was one of those birds. I’d been off work so the job had fallen to Mary, but she’d also given my name and number to two callers who were keeping an eye out for the creature. Finally one of them phoned me. I instructed her to call as soon as the peli returned which happened the next day. As luck would have it I was attending swans in Varsity Lakes, not too far from Currumbin Waters. Anticipating a meal of fresh fish the peli stayed put for the 15 minutes until I arrived. I quickly sized up the situation. Its standoffish attitude made it clear that I had no time to muck around and would have to blow a net over the bird quick smart. It took a while to position the creature for the shot but the net flew true and although the peli took off and made it to the water it was hopelessly entangled, along with one hapless gull. I bundled the bird into the car, but before making the trip to hospital I wanted to call the ‘Blue Bird of Happiness’ and give her the good news, and of course remind her that ‘there’s no point in sending a girl to do a man’s job’. She just loves hearing that! I have to hang up immediately before I cop a torrent of abuse. Then I turn and face south just in time to watch a blue cloud of expletives rise up over Tweed Heads. Ah, it’s all in good fun. Mary was over the moon to hear the bird had been caught. We had to accommodate quite a few orphaned cygnets during August. This can be very difficult because often there’s just no place to put them. Grovelling and prostrating for Mic (Dr. Pyne) at the hospital in the hope that he’d relent and hold them there for a bit longer got me nowhere. Then I remembered a small enclosed pond on Macintosh Island just north of the heart of Surfers. Macintosh Island is a lovely little oasis covering several acres where visitors stroll and families enjoy picnics. It has a waterway running through and is rich in bird life including lots of very tame geese, ducks, several peacocks and a family of bush-stone curlews. A great place for everyone. The pond is ideal. About the size of an average backyard it has its own little island in the middle. 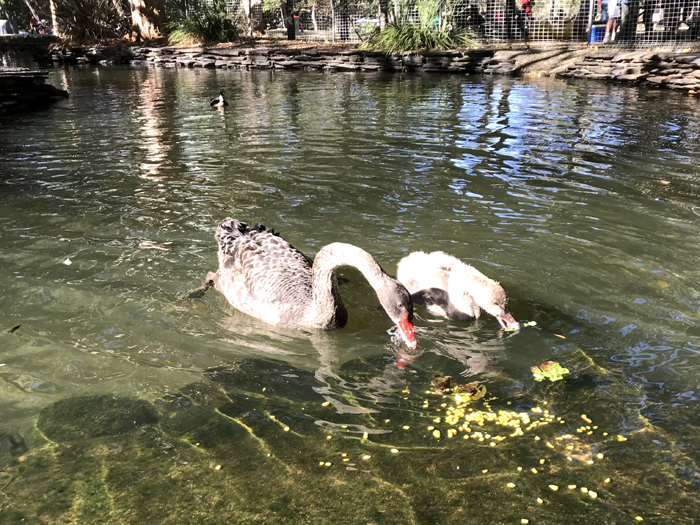 I visited Mark, the head groundsman, and asked if he would accommodate a couple of young cygnets that needed 4 weeks care, after which I’d catch and transport them to Robina and release them into the wild among other swans. Mark loves his birds and was happy to oblige. The first two cygnets we housed have already matured and are back in the wild. Two new cygs have replaced them. 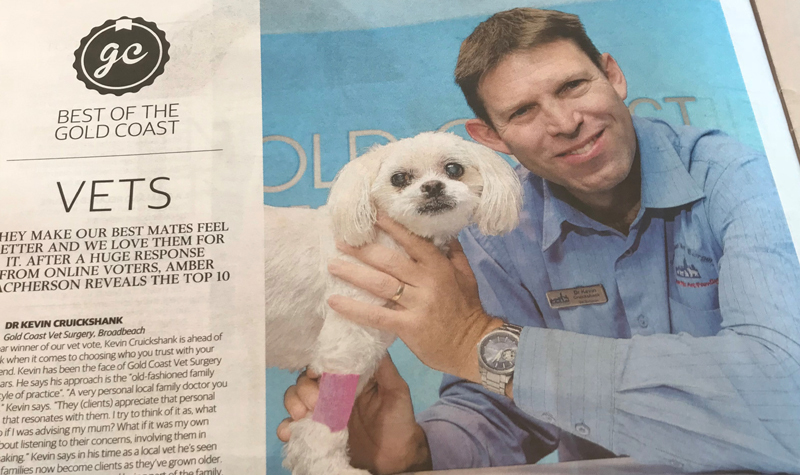 Bruiser and young Willy are of quite different ages but co-incidentally were swimming together when I first discovered them in a canal in Broadbeach. Willy was way young; only about 5 weeks old (barely the size of a duck). Far too young to be on his own. I suspect he’d been kicked out of the parental nesting area (this happens if parents begin nesting again too early) and had teamed up with Bruiser and his brother who’d probably suffered the same fate. I wasn’t so concerned about the two older birds but knew that I had to catch Willy. Above right. Enjoying their afternoon meal. What more could little bird’s ask for? Willy at right. A week later I was called about one of those older cygnets, seen with a fish hook in his knee. He was subsequently named Bruiser and after a brief period in hospital, he and Willy are together again, this time in the pond at Macintosh Island. It contains some food but not enough for two growing birds and so Mark feeds them in the morning and I feed them again every arvo (lettuce and fresh corn). Interestingly this pond used to be almost devoid of water birds. 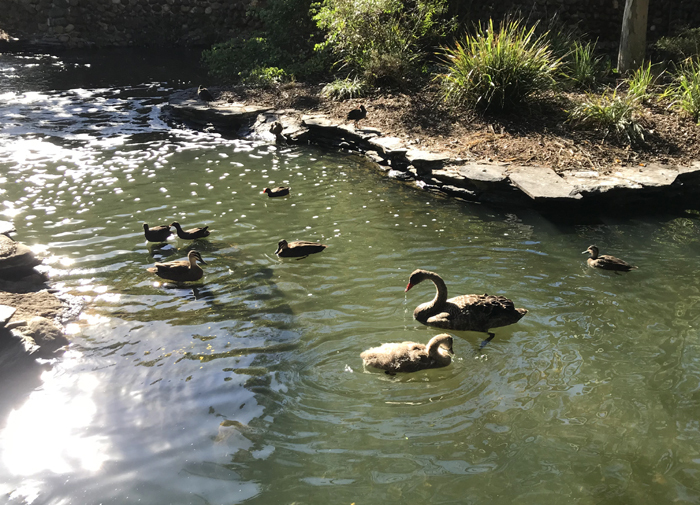 Now, in addition to our two swans, there’s ducks, pigeons, water hens and a bush turkey. Even the odd peacock can be found in there. Bruiser is almost ready to leave but Willy needs another 4 weeks in care. They’ve become firm friends so I’ll try to hold off and release them together. Below is Scamp. I caught her at 7pm one night on the shore of the Nerang River, right in the heart of Surfers. Some clown had hooked her and cut her free. Luckily a local resident saw the injury and phoned Wild Bird Rescues. Scamp’s neck was torn open (luckily, not too badly) and she had fishing line trailing. She was quite distressed. It’s only because of years of experience that I was able to secure her quickly, in the dark. As I approached the water I kicked off my new thongs. After grabbing Scamp I ran her along the beach to a nearby light where I could see the hook in her neck more clearly and remove it. A few minutes later, while loading her into the back of my car I realized I’d forgotten my thongs, so ran back to get them. They were nowhere to be found. Some upstanding citizen must have snaffled them while I was rescuing the bird. Sheeesh! At left, too late to go to hospital Scamp spent a comfortable night on the aft deck of my yacht. OK, so they were only thongs … so what? Well, let me tell you, thongs ain’t thongs anymore. Sure, you can by five buckers from Tarjay, but they only last a week. Complete waste of money. From there the sublime becomes the ridiculous and the price of the humble thong skyrockets to anywhere between $50 and $90! What the ???? When I was a lad (don’t you hate these ‘when I was a lad’ stories). Anyway, as I was saying, when I was a lad of 16, having proudly secured my first job shovelling compost for the Mosman Park Council (in WA) and earning the grand total of 31 dollars a week, had anyone had told me that in years to come I’d be working 3 x 40 hour weeks shovelling compost (read … horse poo) just to save enough to buy one pair of thongs I’d have thrown down my shovel and become a monk. As for the thief, all I can say is … karma will catch up with your sorry arse. A well-deserved award for a very kind and helpful man and his wonderful staff. Late August saw a couple of days of heavy rains hit the Goldie. This can be disastrous for swans with nests built on low ground. Calls started coming in early as the water levels began to rise. Often there’s nothing that can be done. The nest gets inundated and the eggs are lost. At that stage they’re only eggs and the birds will usually rebuild and lay again in as little as two weeks. People often ask ‘but can’t the eggs be saved’. Technically ‘yes’, legally and morally ‘no’, meaning people shouldn’t interfere and instead allow the situation to run its course. Personally I’m very against taking swan eggs to be hatched in an incubator. This produces a clutch of tiny orphans requiring 20 weeks of care with none of the necessary parental guidance from mature swans. Lousy idea. 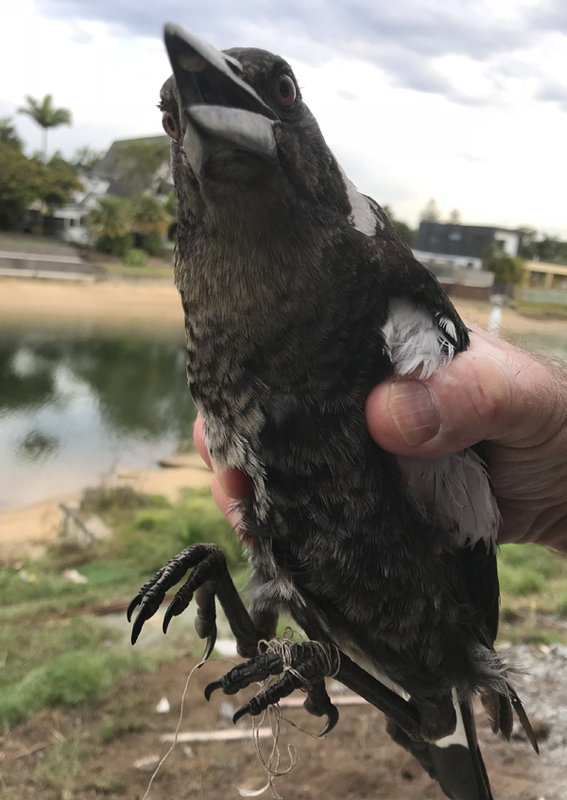 The first call that day concerned a pair nesting in Tugun on the lake near John Flynn Hospital. They’d lost their previous two nests to flooding. 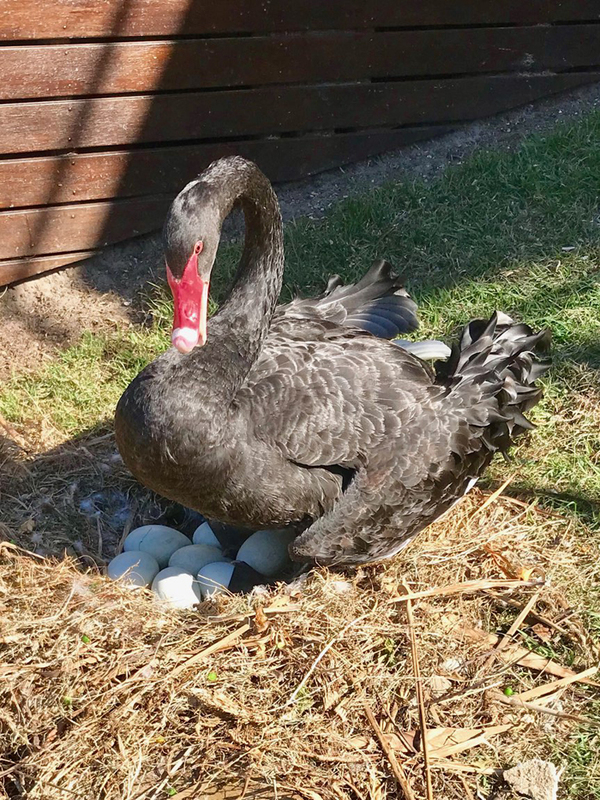 This time they had 5 eggs and local residents were panicking. The caller was able to provide a good description of events. It sounded like we might be able to drag the nest higher; a couple of feet might do the trick. But just I was getting into my car he called again with an update. Two cygnets had hatched some hours earlier and another two hatched in the previous 30 minutes, leaving just one egg. Three of the hatchlings looked to be doing well but one was struggling. The nest and remaining egg had gone under. All in all this was a very good result considering that if the rains had come 24 hours earlier none would have survived. At left. 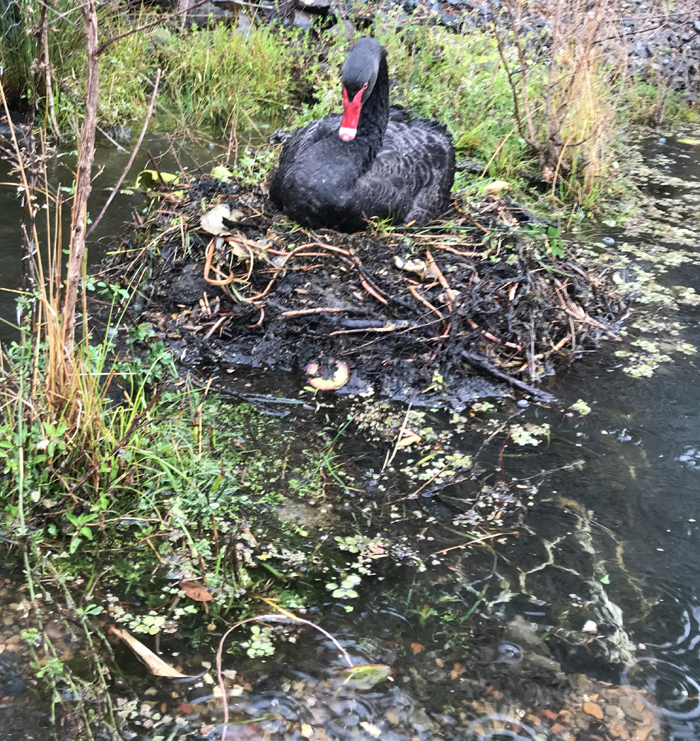 A big male sitting on eggs at Robina, watching as flood waters rise and no doubt contemplating the gravity of his situation. 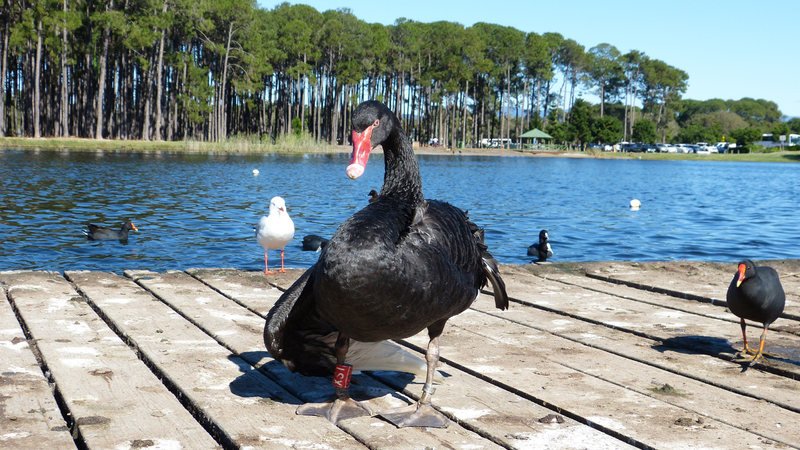 The second nest at risk was at in the lake behind Robina Town Center. The caller made the situation sound acute but when I arrived it didn’t look too bad. The rim of the nest (pic above) was still a good foot (300mm) above the water level of the lake. I approached the male and stood him up. He was on 6 eggs. Being in the base of the nest they were only 6 inches (150mm) above water level. A bit too close for comfort. I sprinted 200m along to the lower weir to check the flow. It looked like the weir could accommodate quite a lot more water before the level of the lake would rise significantly. If the rain would just stop, as predicted, the nest should be OK. Above right. 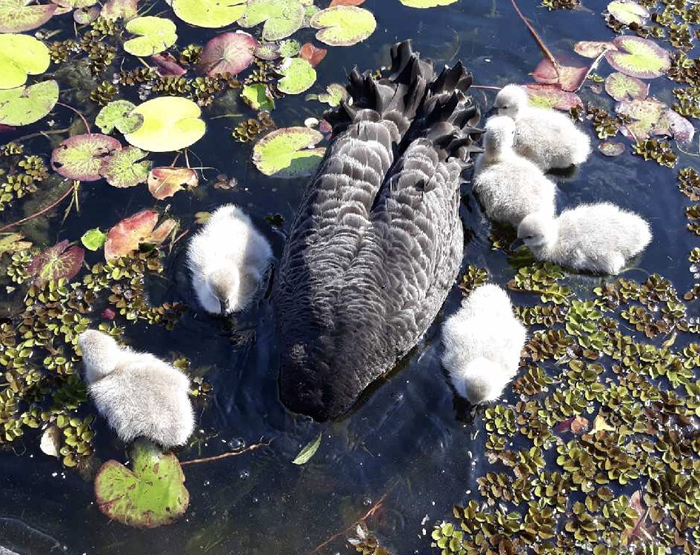 The new cygnets hatched just hours after the flood had abated. For once we were in luck. The rain came to an end two hours later and the next morning all 6 cygnets hatched. Close one! It was good news too for Lelu and Stanley, a pair that nest regularly in a canal at Bundall. You may remember Lelu from a couple of my Facebook posts after she was hospitalised (twice) with suspected botulism, then again some months later with a deep gash in her upper bill. She survived it all and along with her partner Stanley have just hatched another 5 cygnets. All are doing well. At left. Stanley sits atop the original 7 eggs. A big clutch. Sadly long time Wild Bird Rescues supporter Helen from Mermaid Waters passed away last month. I first met Helen when we collaborated to have Council fence off the small jetty on the lake at Pizzy Park. 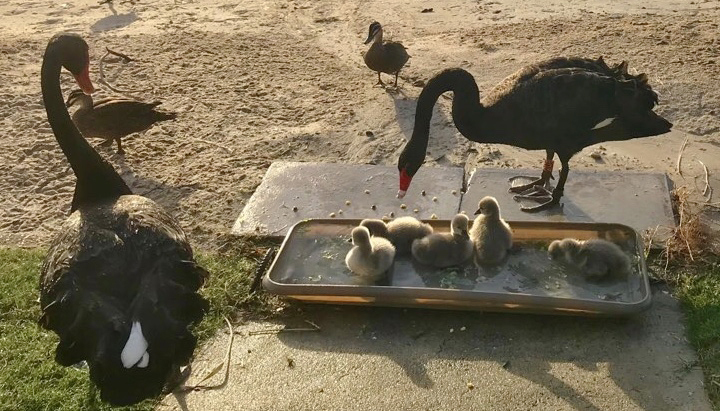 It was a favoured nesting site for swans, however they were at grave risk because Pizzy is an off-leash dog walking area and the jetty was very close to the path. Resident swans had endured 5 dog attacks in as many months, some with terrible results. Much of the problems stemmed from one woman walking 3 unruly dogs off-leash. It took us a full year and much frustration to get Council to erect a 1200mm high chain-link fence across the face of the jetty, creating a small sanctuary. That was 5 years ago. I haven’t had a single report about a dog attacking a swan at Pizzy Park since. At left, a big male swan with his right wing dragging on the jetty just hours after a serious dog attack. I caught him and got him to hospital quickly. He was very lucky to survive. Over the years Helen called me countless times to rescue birds. Mostly it was hooked or entangled swans and ibis. She was also a staunch campaigner against the hoons in tinnies that wreak havoc as they race through GC waterways. One of Helens friends called to tell me that she’d passed away suddenly from unexpected illness. I’m saddened that I didn’t know about this and wasn’t able to visit. Helen died without a will but her brother honoured her final wishes and made a generous donation to Wild Bird Rescues on her behalf. Through that donation I’ll see that Helen’s love and care of the birds will go on. Let me tell you, I can spot a fishing line entangled ibis from a moving car at 50 meters, easy. I can spot a nice piece of cake, from a moving car at three times that distance … at night! Just look at this piece at right, adorned with all those yummy goodies. There’s chocolate and lollies and sugar and flavouring and sugar and colourings and more sugar. 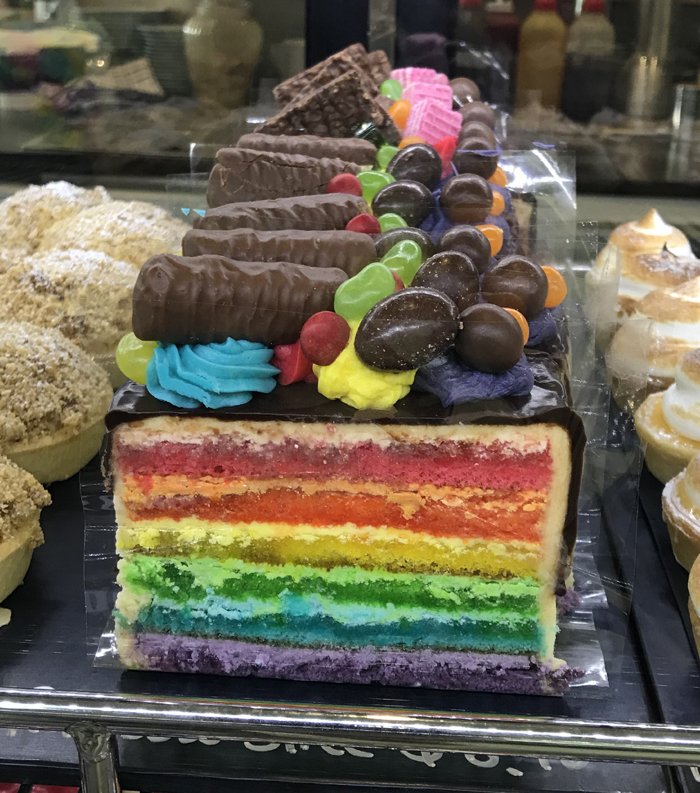 I’m not sure that one would survive a whole slice, but it’d be worth a try! What is it about maggies? They just can’t seem to pose for a good photograph. It’s always head up; face away from the camera; look miserable. Of course this might have something to do with being held in a vice-like grip by a horrible human. That grip is very important because even though pics are important and allow thousands of people to see firsthand what’s going on, there is nothing worse than catching a bird only to have it escape from your hands. Bloody hard to catch a second time. The little chap at left would turn up for lunch everyday with his family at a building site in Broadbeach. A bobcat operator saw him struggling with line around his feet. It was our old friend braid again. Super strong non-stretch fishing line that would have cut the bird’s toes right off in no time. I caught the maggie and quickly cut away the line. Fortunately we’d got him early so there was little damage. He was returned immediately to his family, unharmed. These have been just a few stories from many during August. 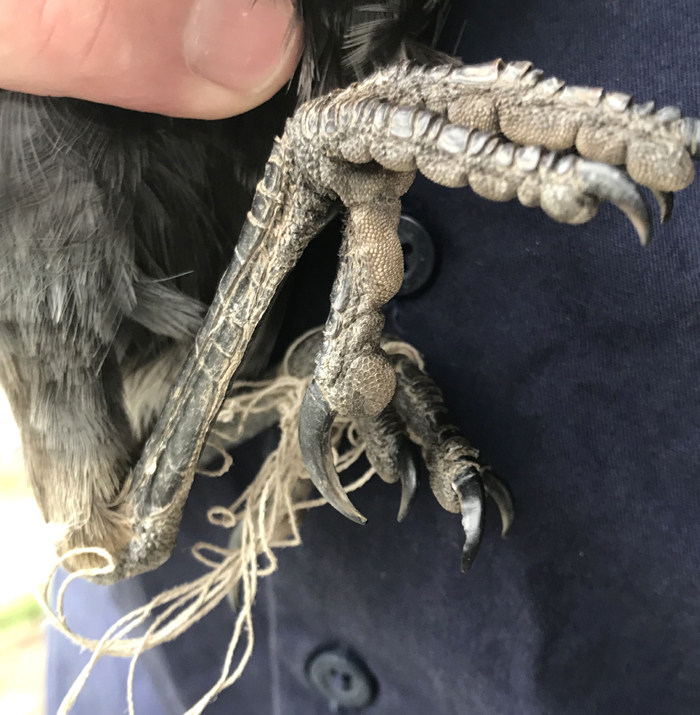 Mind you, it hasn’t escaped my attention that I haven’t subjected you to even one picture of a manky ibis foot in this WHOLE report. Don’t expect to be so lucky next time! 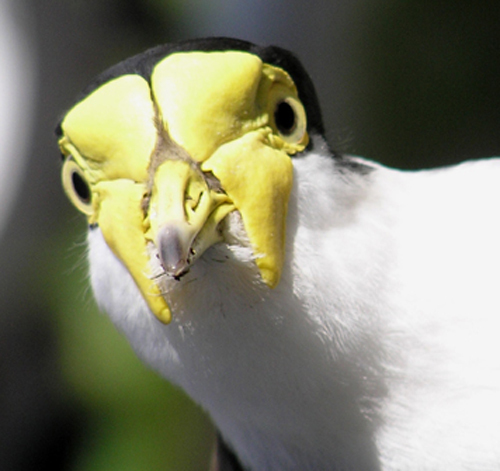 Thank you for supporting Wild Bird Rescues. Your help means that you are part of every rescue we do. Special thanks to our patron Jim Downs and to Liz and Paul on the Donations Committee.